This traditional photo booth offers the old style adjustable seat and prints out one black & white strip. 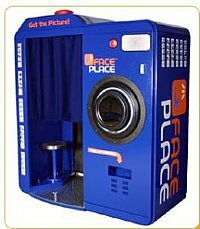 Due to its large interior space often times there more than two guests inside this old fashioned photo booth. Several of the pictures that we see have more than three heads in them adding to the fun of this old fashioned booth. The print out of the strip takes place within 25 seconds, the print out can be customized and the photo strip size is 2 inches wide by 8 inches long.